Award-winning publisher Archaia Entertainment, an imprint of BOOM! 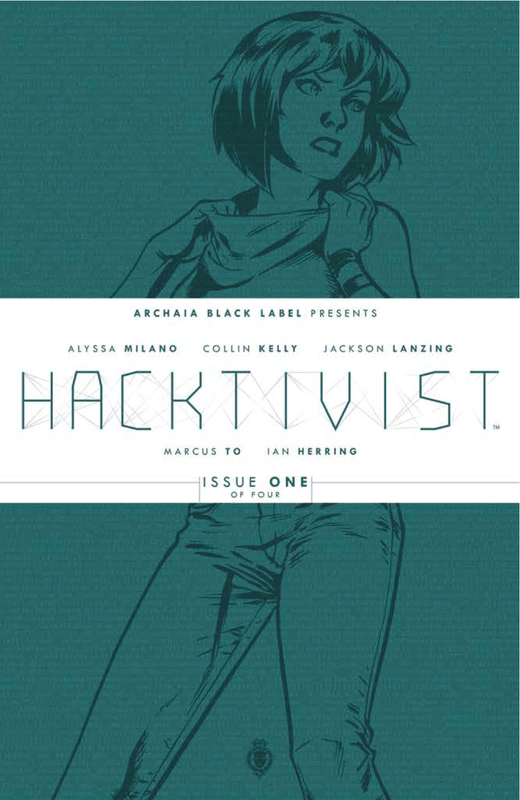 Studios, is excited to announce that Alyssa Milano’s HACKTIVIST will debut as a new, four-issue limited series in January. Set in the world of tech entrepreneurs and social media, HACKTIVIST is the story of two friends who operate one of the largest social media firms by day, but by night, use their hacking skills to help important social causes all over the world. That is, until the U.S. government finds out! WHY WE LOVE IT: From the creative mind of Alyssa Milano, with artist Marcus To (CYBORG 009, HUNTRESS, RED ROBIN), and writers Jackson Lanzing (FREAKSHOW) and Collin Kelly, HACKTIVIST is a fast-paced cyber-thriller about friendship and freedom in a time of war. WHY YOU WILL LOVE IT: Fantastic characters and stunning action set pieces, beautifully illustrated by Marcus To and Eisner Award-nominated colorist Ian Herring (JIM HENSON’S TALE OF SAND). WHAT IT’S ABOUT: Ed Hiccox and Nate Graft are young, brilliant, and the co-founders of YourLife, a social networking company that has changed the way the world stays connected. In secret, these best friends are also “.sve_Urs3lf,” the largest, white-hat hacking group on the planet, exposing information and sparking revolutions across the globe. HACKTIVIST #1 arrives in comic shops on January 22nd with a cover price of $3.99 under Diamond order code NOV130890. Not sure where to find your nearest comic retailer? Use comicshoplocator.com or findacomicshop.com to find one! It’s also available for order directly from boom-studios.com.